How do I create a conference in a student group? You can create a conference in your student group. Conferences can be created with as many users as needed, though the recommended guideline is a limit of 100 users. You can create multiple conferences, which are listed in chronological order by the date they were created. The most recently created conference will appear at the top of the list. Note: Creating a conference is a course permission. If you cannot create a conference, your institution has restricted this feature. 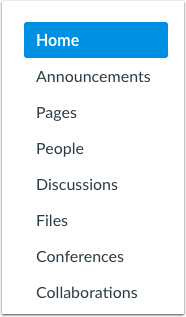 In Group Navigation, click the Conferences link. Click the Add Conference button. To create a new conference, type a name for the conference in the name field . If you want to set a time limit on how long invited members are able to join the conference, enter the number of minutes in the duration field . The time limit will begin when the presenter starts the conference. Once the duration has expired, new participants will be unable to join and the conference will continue until the last person leaves the conference room or the conference organizer concludes the conference. If you want to enable recording options for this conference, select the Enable recording for this conference checkbox . If you don't want to set a time limit for the conference, you can create a long-running conference by selecting the No time limit (for long-running conferences) checkbox . To create a description of your conference, type a description in the description field . 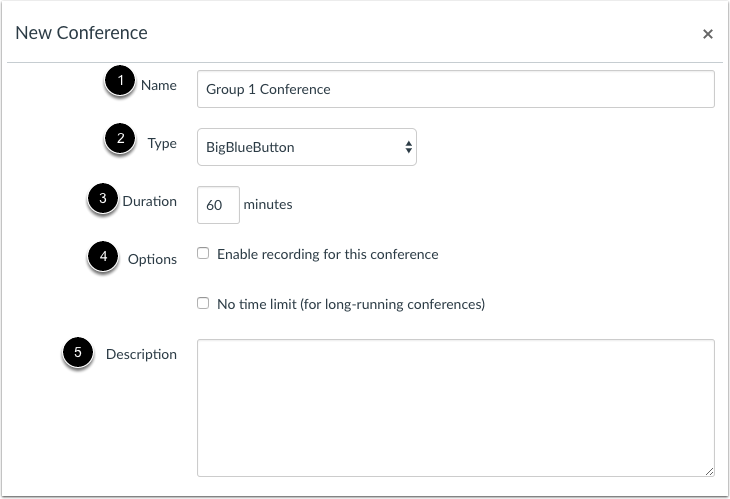 You can add any user in your group to your conference. However, once a user has been invited, the user cannot be removed from the conference. By default, all members in the group will be invited to the conference . To remove all group observer members from the conference invitation, select the Remove All Group Observer Members checkbox . When this checkbox is selected all course members except observers are invited to the conference. Note: Conferences can accommodate as many users as needed, though the recommended guideline is a limit of 100 users. If your group contains more than 50 people, you will have to invite group members individually. If you want to select specific members of your group, deselect the Invite All Group Members checkbox . Select the checkbox(es) for the individual member(s) you would like to invite . Previous Topic:How do I use Conferences in a course as a student? Next Topic:How do I delete a conference in a student group? Table of Contents > Conferences > How do I create a conference in a student group? Re: Is there a chat option for students within groups?